Carrot & Banana cake with pecan nuts. A delightful, simple flop-proof cake. Empowerment is one of the buzzwords circulating freely today. But have you ever taken five to consider what “empowerment” really means? Educationist Dr Seth Kreisberg of the University of Massachusetts suggested in 1992 in his educational classic** that empowerment was “the capacity to implement”. Implicit in this concept is that change (and growth) is involved. Through learning to make or do stuff, you gain (change) in self-confidence and ability. Skilling is a very self-empowering process. I took Seth Kreisberg’s sense of empowerment to heart and devoted much of my time at home to “empowering” my extended family members with home skills (carpentry, mucking around with engines, reading for pleasure and information, growing things, and preparing food). The first non-essential, but very rewarding, skill everyone learnt in the kitchen was how to bake a flop-proof Carrot & Banana cake. We have been baking this cake since the end of 1992 when Matt (Thabethe) and I modified a recipe from the “Great Baking Classics” supplement in the July 1987 Living and Loving magazine. Further modifications followed over the years with suggestions and tweaks from Puggy (Xaba), TZ (Thabizolo Msimang), Philani (Khumalo), Khaya (Mwelase), Bam (Phumlani Hlatshwayo), Senzo (Khanyile), Zotha and Zazi (Shange), and Phila (Msimang), along with Michael and David. David, now living in Derby, England, also bakes really good-looking proper bread (made with yeast – not the “health” variety soda bicarb bread). Michael, a fine artist, knows that man does not live by bread (or meat) alone — he is continuously experimenting with simple, tasty, vegetarian dishes. As with many of our basic recipes, the basic measuring unit is one of our cups (a 250 ml coffee mug). But any standard cup will do. Cooking is not so much about precise quantities, but rather about correct proportions and understanding what is going on with your ingredients. A “pinch” is the amount that can be held between the tips of the thumb and fore-finger. A “generous pinch” is between thumb and crooked fore-finger. I don’t do ml. I have never understood the pedantic translation of those early rough-and-ready recipes with handfuls, tablespoonfuls, and cups of this, and a pinch of that, into precise metric equivalents. We do not use an electric mixer. All mixing is by hand with a wooden spoon. You have better control and reduce the risk of the gluten in the flour reacting too quickly through over-mixing, forming a “doodgooi” heavy dough. a pinch of mixed spice. This is an essential flavourant for carrot cake – a ground mix of pimento (all spice), cloves, cassia, and nutmeg. Switch on the oven to preheat at 180 degrees C.
Into a mixing bowl add the sugar and the diced butter. Microwave on high for one minute. Stir well. Add the beaten eggs and vanilla essence. Mix well (hand mix with a wooden spoon). Add the mashed bananas. Mix well. Sieve into the mix a cup of flour and the baking powder, salt and mixed spice. Mix well. Add the second cup of flour. Mix well. Add the grated carrot, raisins and broken pecan nuts. Mix well. Add the half cup of water with dissolved bicarbonate of soda. Mix well. Divide the cake batter evenly into two pre-greased medium loaf-shaped tins (wiped generously with a torn-off square of butter paper or sprayed with Spray n Cook®). Use either anodized aluminium, glass Pyrex®, or heavy silicone rubber pans (Woollies ones are best). Bake at 180 degrees C for 45 minutes to an hour, depending on oven size, age, and whether fan oven or not. We use a 32-year-old Defy® Thermofan 418. Most of the wiring, all the rings, a number of switches etc have been replaced by us over the years. But it still keeps going. Test for doneness while still in the oven by probing the loaves at either end with a wooden skewer. If it comes out clean, the cakes are done. If it comes out with gunk, they are not ready. If gunky, close the oven door and let them do for another 15 minutes. Let the cakes cool in the loaf pans on a wire rack for 10 minutes before removing them from the pans. Let them dry and cool further, bottom-side down, for another hour before wrapping them in aluminium foil. You can slice and eat them while still warm – yum, but crumbly. If you let them cool properly then they will firm up and slice well with a sharp knife. They keep well, wrapped, for several days. 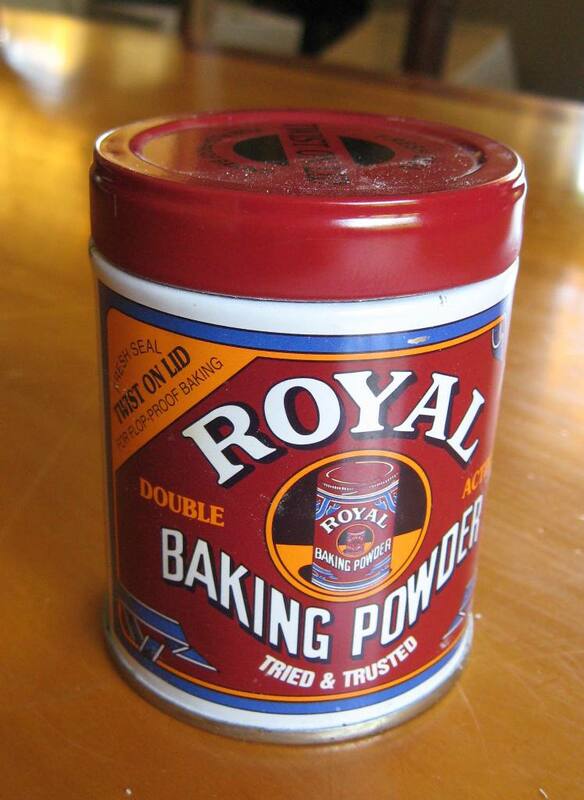 Baking powder tin with tight-fitting lid. baking goods shop (shame on your mother for not passing on her old baking powder or cocoa tins. Today most brands of baking powder and cocoa come in useless plastic containers – absolutely not suitable for steaming bread!). Later in life, when I began living with Zulu people, I was introduced to a completely different steamed bread, ujeqe (pronounced: u- ch- eh- tongue descending plosive click- soft, disappearing uh). Recently a friend inaugurated me in the rites of making ujeqe. So give tradition a go! A good ginger bread is made somewhat differently to these simple recipes. I will add it later (I need to do some experimenting!). 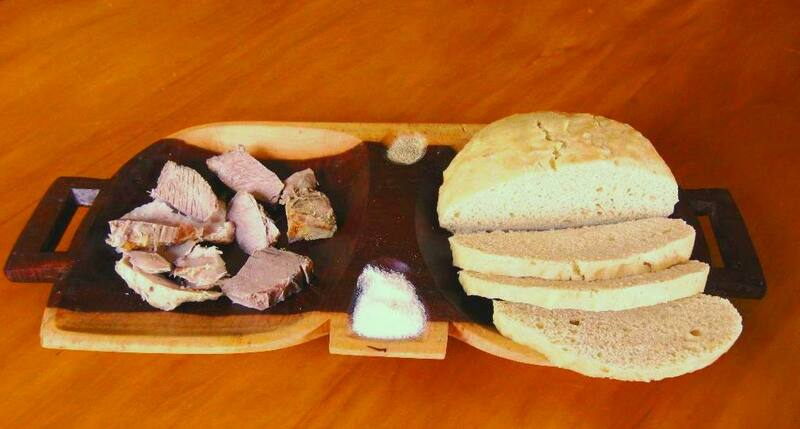 No traditional feast or ceremony (umsebenzi) is complete without slices or hunks of freshly-made ujeqe, traditionally served on a wooden platter (ugqoko), alongside chunks of meat (usually the sacrificial goat) and small mounds of salt for dabbing the meat. There is a bit of controversy over the correct name of the wooden platter. Purists call it ugqoko, but current usage is to call wooden serving platters isithebe (traditionally a name reserved for the finely-woven small mats on which ground maize is collected, also used for serving vegetables). This was the recipe given me by Khumbuzile, the other half of good friend and journalist, Sbu Mboto, and mother of his, at the time of writing, last born, Zander Satchmo. She made it for me on Christmas day 2011 when the three were around for lunch, along with Bam – Phumlani Hlatshwayo – Khaya Mwelase and his lively young brother, Sanele, Girlie Makhathini (Khaya’s grandmother and my vegetable gardening mentor), and Senzo Khanyile and his fiancée Sle (short for Slender) Mthalane. 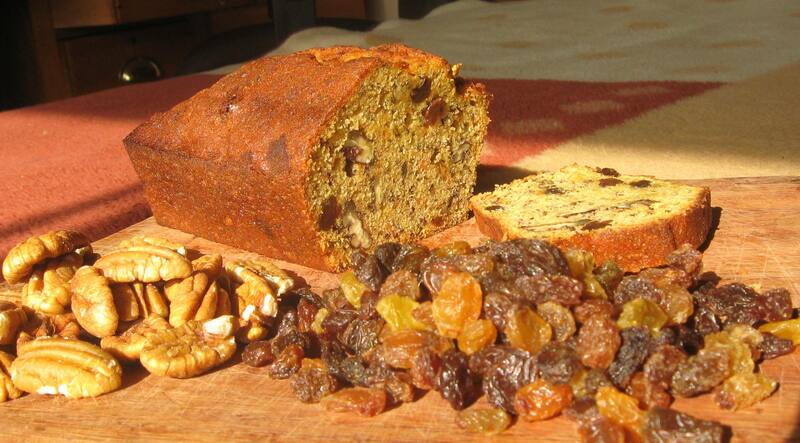 Traditionally ujeqe is made from crushed fresh mealies rather like the traditional South African steamed green mealie bread. The recipe below, however, is the one all township folk use. Mix dough and knead lightly. Place in a covered glass dish in the sun to rise for an hour (or any other warm place). 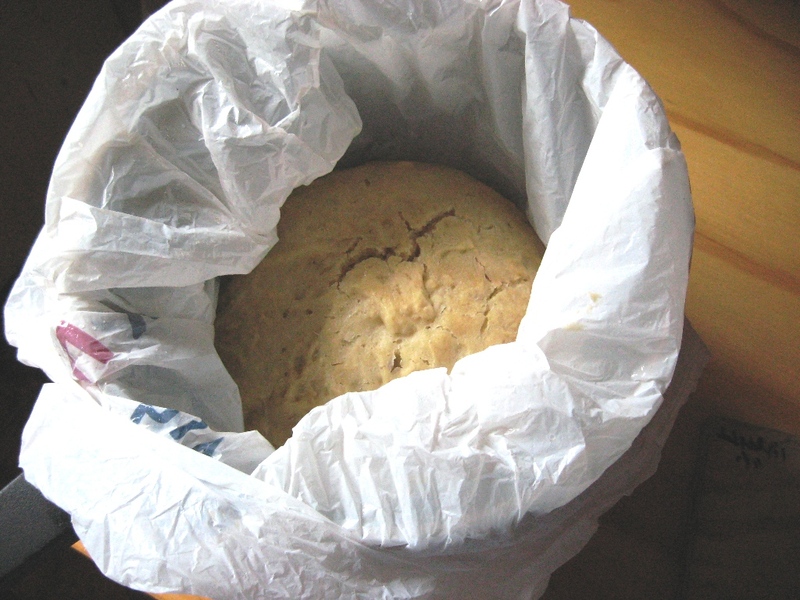 The dough wrapped in an oiled plastic shopping bag and placed on a steaming rack inside a pot. Oil (with olive oil or margarine) the inside of a plastic shopping bag (which you have wiped first – you never know what has been inside it, says Khumbuzile). Place the risen dough in the bag and tie the top to stop water getting in. Place on a legged expandable vegetable steamer in a pot with boiling water up to the steamer platform. Lightly boil for an hour. By then the bread should be done. Check the pot from time to time to see that it has water (you are making steamed bread, not potjie roasted bread which is another recipe). Opening ujeqe to check that it is cooked. After an hour of boiling open up the bag and slip a wooden skewer into the middle of the bread. If it is done it will come out smooth. 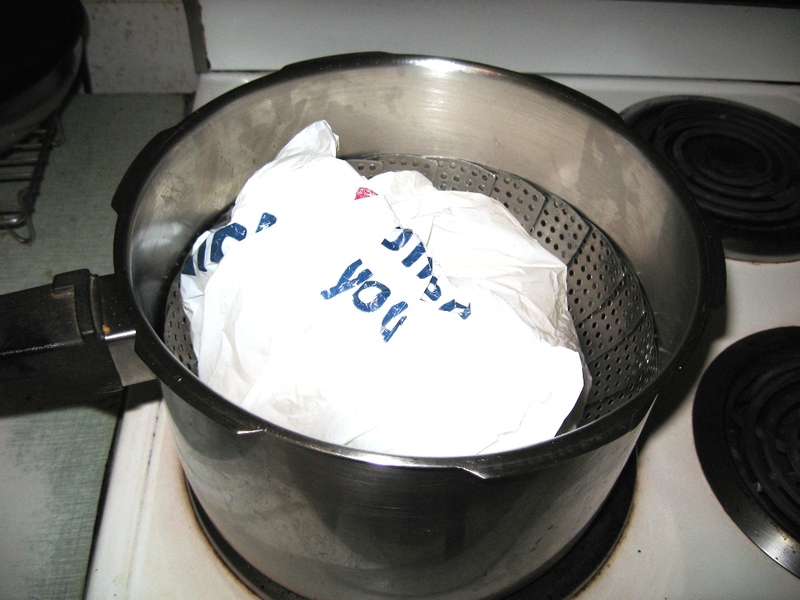 If still sticky with gunk then close up the bag and continue boiling for another 20 minutes. When done the steamed bread has a light tan “skin”. Allow to air on a rack for a few minutes before serving. The result is a delicious, coarsely-textured, slightly chewy bread which is not wet (as you may have expected) but light and firm with a nutty aroma. Wonderful bread. I eat it with honey or fruit preserve. Or even with (to the horror of my friends) with my favourite full-cream maas (thickened sour milk) (amasi), traditionally prepared in an igula, a calabash (the dried outer husk of the fruit of iselwa, the squash family calabash gourd plant, Lagenaria siceria). This is really a steamed soda bread, as opposed to a yeast bread. If you don’t have mealies then use most of two drained tins of corn (or sweetcorn emptied into a sieve so you can wash out all the creamy gunk). 2 ½ cups minced or coarsely blended green mealies cut from the freshly-picked cob. Mix mealies, salt, sugar, baking powder in a bowl. Add beaten eggs mixed with the melted butter. Mix thoroughly. Pour the mixture into a greased 500g baking powder tin. Place a disc of greased waterproof paper a little larger than the tin diameter on the tin (also known as greaseproof paper) (if you don’t have any just grab a sheet of paper from your printer and rub butter on both sides – works even better!). Screw the lid down over the greased paper. 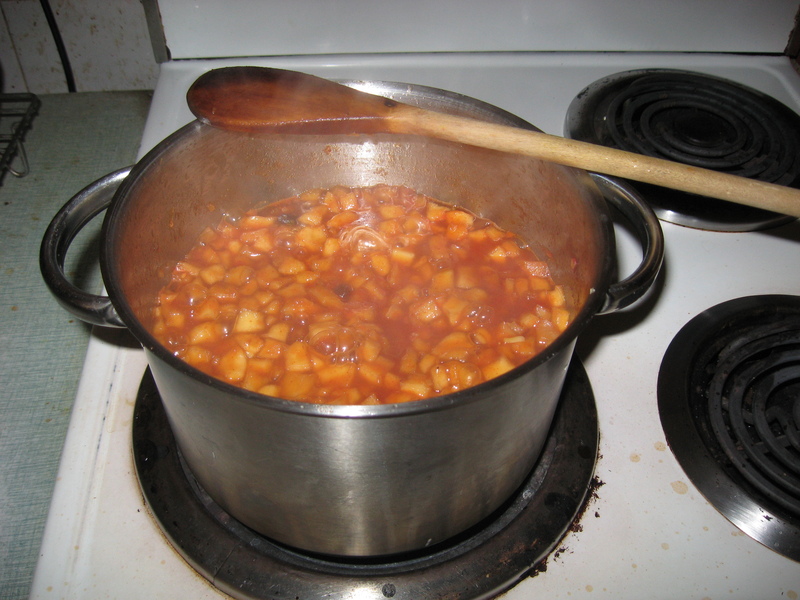 Place on a trivet or pot stand inside a large pot and add water to reach two-thirds up the side of the tin. Lightly boil for 1 ½ to 2 hours. Very nice with golden syrup, honey or just a dab of butter. A nice bready side-dish instead of boring rolls (rolls – yuk! Only plebs or fast-food joint habitués have rolls with a meal. Rolls and boerie or chicken sausage on Friday night are acceptable. But not with a dinner – puhleeez!). A tea cake steamed soda bread. Mix dry ingredients. Blend the warmed milk and syrup and add to the dry ingredients, mixing thoroughly. Makes enough batter for two tins. Fill each tin two-thirds with the mixture and cook as above for steamed mealie bread. If music be the food of love, play on. But food itself is more than nutrition for the body, it is also the music of loving memories. Last night my youngest own-blood son, David, sent me a skype message from faraway England asking whether I still had Philani’s wonderful melktert recipe. David’s request triggered a rush of memories, but I was sitting on a deadline so said I would get back to him today. 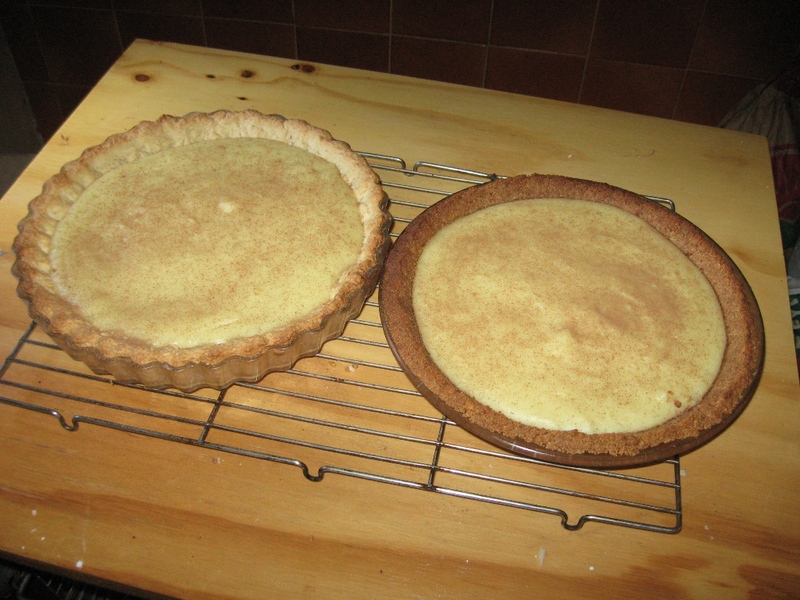 When I woke this morning I decided not only to dig up Philani’s recipe, but whip up two melktert with different bases and write it up for the blog. Working with me on this project was long-time member of our extended family, Khaya (Mwelase), a trainee paramedic with NetCare 911, who was off-duty for the day. Philani, let me first explain, is Philani Khumalo, a tall easy-going, seriously intelligent young attorney who now works in Johannesburg. For many years, while completing school and then studying law at university, he was a much loved member of our household. He loved nothing better on Saturday afternoons than putting on his favourite Philip Glass opera, Akhnaten, and cooking up a storm in the kitchen. Invariably, due to popular demand he would produce his justly famous melktert which he had perfected and to which everyone still refers nostalgically. South Africa is a hunter’s hotpot of cultures and their foods. The Dutch contributed not only their language, the backbone of Afrikaans, but also several delicacies which have joined the ranks of our popular national food symbols: melktert, intertwined koeksusters, and the ball-shaped vetkoek. 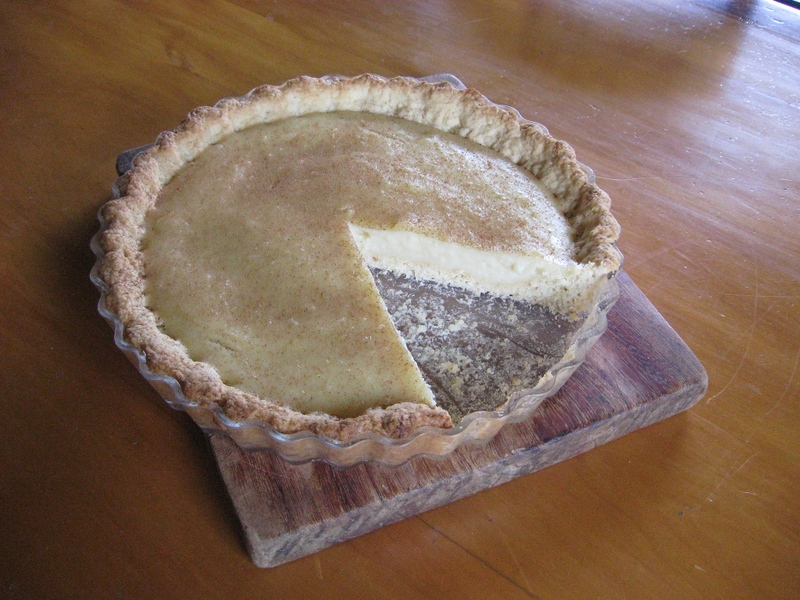 Although melktert is sometimes translated as milk tart, or baked custard pie, most people know it as melktert. 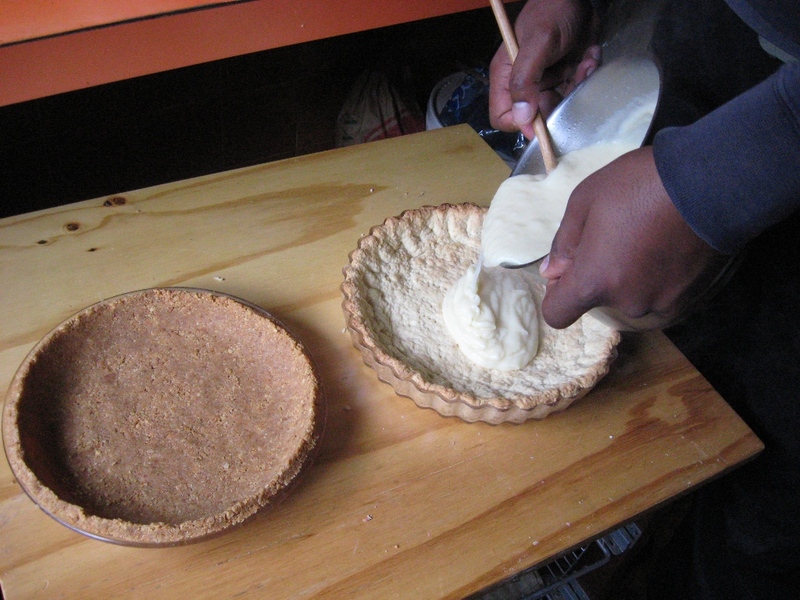 The basis of Philani’s melktert was a recipe he got from the back of the box of another South African traditional symbol, Maizena® (the South African standard household cornflour brand). I still have the old original recipe, as well as our modified recipe given here, but do not have all Philani’s variations. Nonetheless melktert in our household is still fondly known as Philani’s melktert. You can use any shallow pie or rippled flan dish with an outer diameter of around 26cm. Grease the dish with a piece of butter paper, or spray it with an anti-stick agent like Spray ‘n Cook®. You will be glad you did when removing a wedge of melktert at the end. 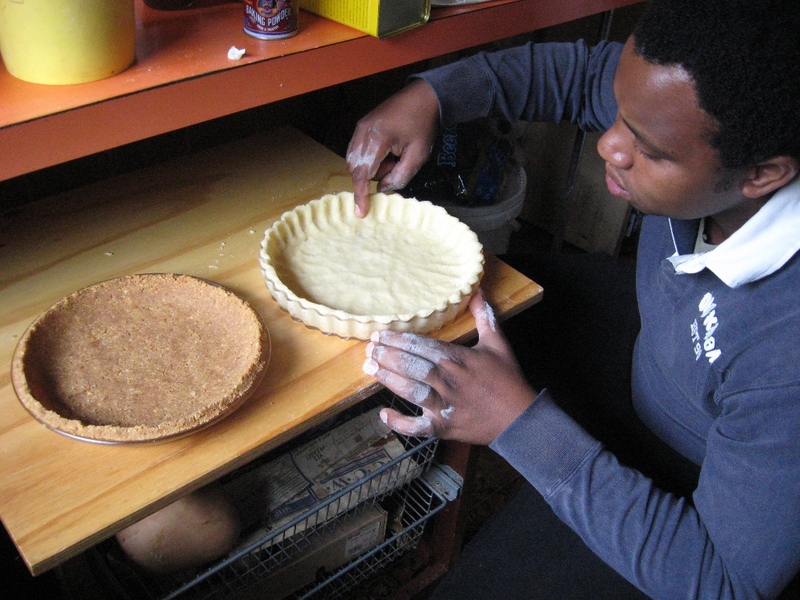 Khaya pressing out the shortcrust pastry base. On the left is the crushed biscuit base. Mix together dry ingredients. Work the butter into the dry ingredients, rubbing between your fingers until there are no lumps of butter left and you have an even-coloured, gritty mix (a bit like fine sawdust). Put the egg yolk in a cup and top up to half-way with cold water, then beat with a fork. Using the fork whisk the beaten egg into the flour mix then with floured hands lightly compress the mix in a ball, put it in a pie dish in the fridge for 20 minutes or so to chill. Once chilled press the pastry evenly out and up the sides. Prick the base with a fork (to prevent unseemly swelling) and bake the shell in the oven for 10 minutes at 180C. Pricking the base of the shortcrust pastry shell. Melt the butter in the microwave for a minute on high. Stir in the crushed biscuit and press out in a pie dish with the back of a spoon. Melt the margarine in the microwave. Beat in the sugar with a wooden spoon. Beat the eggs and then mix thoroughly with the margarine and sugar mix. Add the vanilla essence. Begin gently heating the milk. 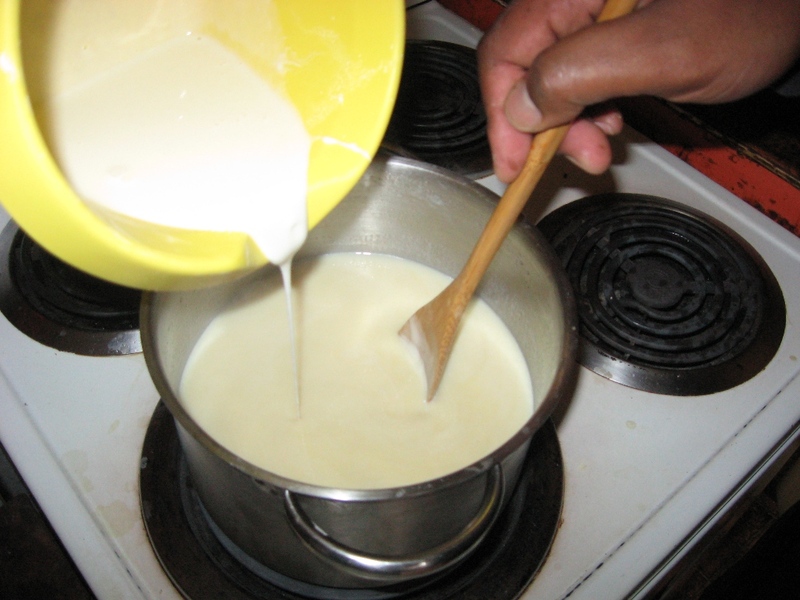 When warm, not hot, add some warm milk to the mix and stir well until the mix combines evenly. Add all of your mix now to the warm milk in the pot, stirring all the while. Pouring the cornflour and cake flour mix into the warm milk mix in the pot. Keep stirring! Meanwhile mix the cornflour and cake flour with some cold water, adding a bit at a time until you have a smooth mix that will just pour. Add this to the warm milk mixture in the pan, keeping on stirring. As the mixture approaches boiling it begins thickening. Let it bubble (boil) for a minute or two as you stir. If you rush this process (too hot a cooking ring) you will get the odd lump or two. But that is not a disaster. Just keep on. The lumps will reduce and you will remember next time to use a lower ring heat, or take the pot off the heat from time to time so that you can match your stirring to the thickening. Pouring the thick cooked custard into the shells. Pour your thick custard mix into the pie shell(s). Bake at 180C for 15 to 20 minutes, then put on a wire rack to cool and set. Sprinkle powdered cinnamon over the baked custard top. The finished product fresh from the oven, with a dusting of cinnamon. You will know that you got it right when you cut and remove that first slice. The custard should be firm and not flow into the space left! You should experiment with both bases. Crushed biscuit is fine (and quick). 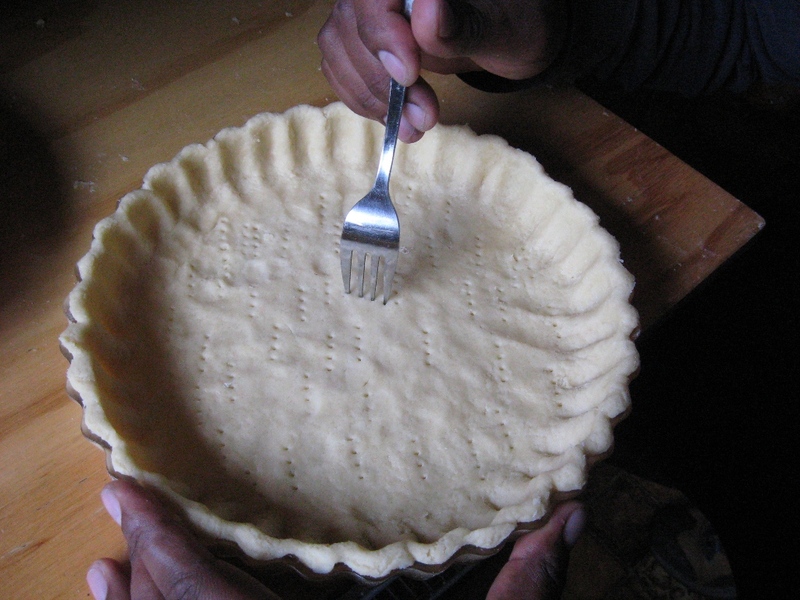 But the shortcrust pastry recipe we use is great for all sorts of dishes, whether as the shell for a quiche or for a pie topping (chicken pie, steak and kidney pie, savoury mince pie). As one who firmly believes that a melting sin on the tongue is worth two furtive sins behind the bush, I take great pleasure in concocting sins in the kitchen. Especially now that summer’s here and one’s activity meter has thawed into life once again. Recently I decided to tackle two delicacies that most of us resort to buying because we think they are just too complicated to successfully make oneself: passionfruit ice-cream and lemon meringue pie. As with all my recipes I like to get down to the core of what makes a dish work without the frilly bits. Professionalism is the ability to understand what you are doing and to practice doing it so that you can get it right every time (barring earthquakes, electricity failure and your son arriving with a pregnant stranger at the kitchen backdoor). Start by switching on the oven to 180C so that it will be ready when you need it. Melt the sugar and butter in a small saucepan on the stove at low heat, stirring as you go. Once fully melted add the lemon juice mixed with the beaten eggs. Keep the heat low and keep stirring until the mixture begins thickening a little. Turn up the heat a little and let it boil for a minute or two while continuing to stir. Bottle and let cool. The recipe works really well if you don’t rush it. And no, for this one you don’t have to use a double boiler. It was given to me by a friend, Sue Rushton, who got it from another friend, Jenny Henrico, who lives just up the road from her. Rub the butter into the flour, baking powder, sugar, salt and lemon zest. 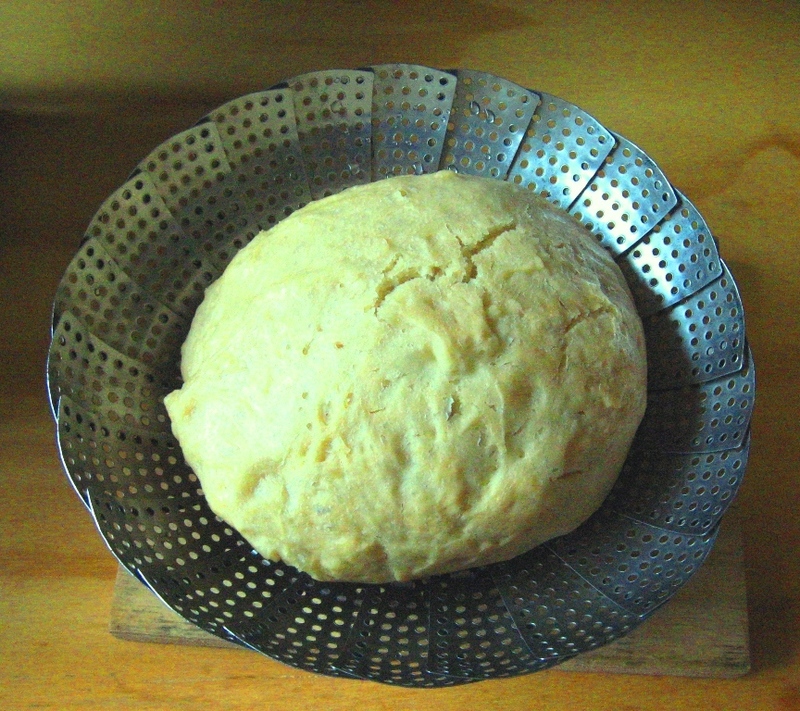 Rub until the flour has become a yellowish granular meal and there are no butter chunks left. Beat the egg yolk in the water and pour slowly into the flour mix, stirring with the tines of a fork. Work quickly, then lightly compress the mixture into a light ball and place in the mixing bowl in the fridge. Never overwork flour when adding liquid, otherwise a gluten reaction kicks in which will turn the baked result into the Dwarf Bread lovingly described by Terry Pratchett. While the pastry is chilling you can make the meringue topping. After half an hour grease a pie dish with a torn off corner of the butter paper (I like those pyrex dishes with the crinkly edges used for soustert, flans and shallow quiches). Put the ball of pastry in the centre and work it outwards. If your fingers get sticky then lightly flour them. Work it to the edge of the flat and then up the rim. Pat the jutting edges level with the rim and then work your way around the rim gently pushing a finger into each crinkle valley to give a nice ripple effect. Cut some slits in the base to stop it developing bubble bottom. Bake the shell in the pre-heated oven for 10 to 15 minutes until it starts browning. Remove and let cool for 20 minutes or so. Beat the egg whites stiffly with a hand mixer (not a machine, they mix too quickly – we’re not mixing cement here y’know). Beat in the cream of tartar, castor sugar, lemon zest and lemon juice. 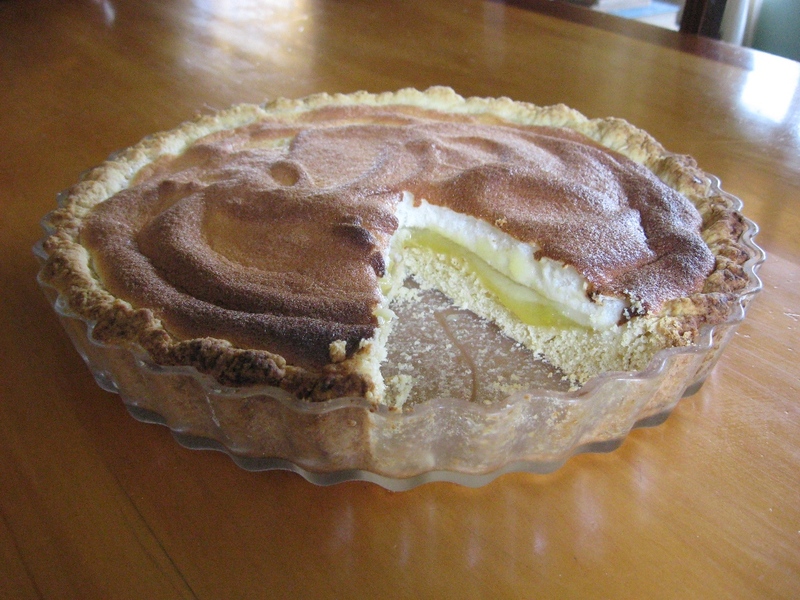 Spoon the lemon curd over the base of the pie crust (you will use about three-quarters of the curd you made earlier). Spoon the meringue over the lemon curd. Place in the pre-heated 180C oven for 20 minutes, turning the heat down to 120C ten minutes after putting the pie in the oven. Best eaten chilled. We grow the large yellow passion fruit (Passiflora edulis f. flavicarpa) but have to beat off the monkeys to get at the fruit which is harvested when it ripens and falls to the ground. We preserve the pulp with sugar (1 cup of sugar to 1 cup of pulp), dissolving the sugar in the pulp in a mixing bowl over several days at room temperature before bottling (cover with a plate when not stirring). Kept in the top of the fridge or on a cool dark shelf it remains usable for months. Just give the bottle a shake every few weeks to mix up the pulp and natural syrup. The ingredient proportions for ice-cream are: for every cup of cream you use 2 egg yolks, three table spoons of sugar, 40ml (1 tablespoon) passion fruit pulp. 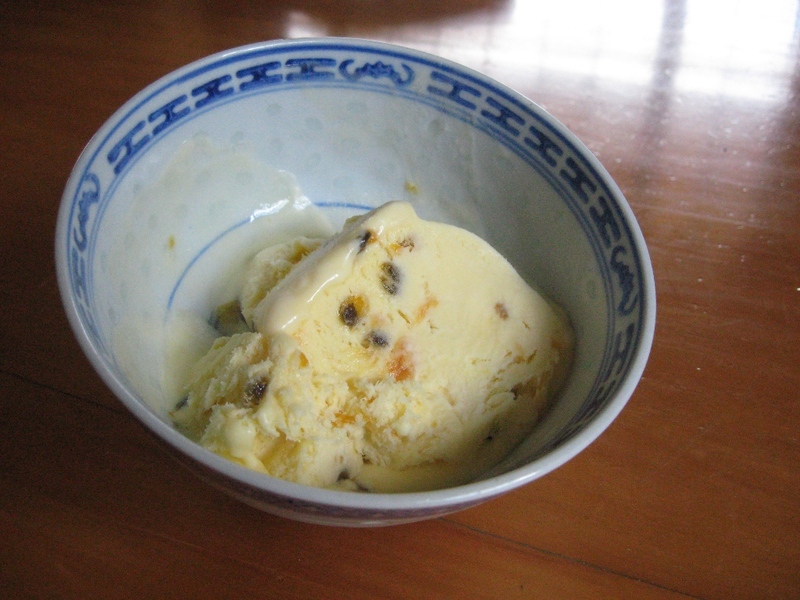 The basic ice-cream recipe (without the passion fruit) was given to us by a Japanese friend, Takeo Horigutsi, in the late 1980’s. Vigorously stir the egg yolks and sugar until they form a nice light yellow creamy consistency. Whip the fresh cream until it forms stiff peaks then add slowly to the creamed egg yolk and sugar mixture, stirring all the while, until you have a nice even consistency. Pour into a 2-litre ice-cream container, stir in three tablespoons of the passion fruit pulp, close the container and place in the freezer for one hour. Remove from the freezer and stir thoroughly once again, ensuring even distribution of the passion fruit pulp. Cover and return to the freezer for a further five hours. Warning: this is a rich, smooth, real ice-cream that rarely lasts more than a day! I still hold firmly to the belief that one is not adequately educated or skilled to useful purpose until you have mastered the art of making marmalade. 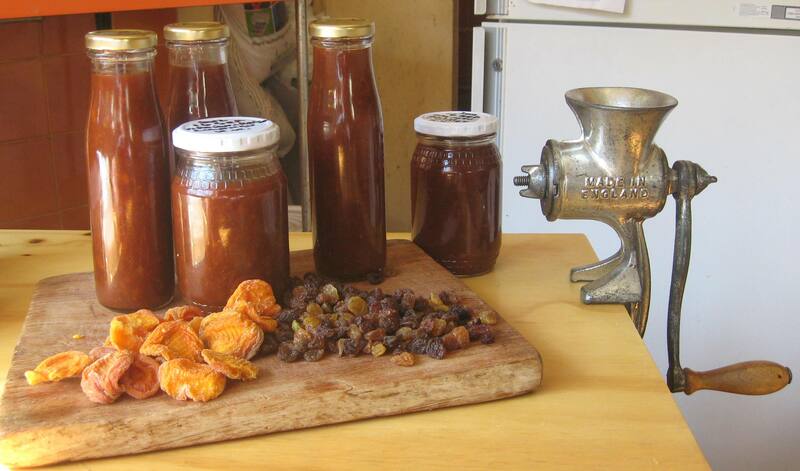 Marmalade is neither jam nor jelly, but rather (the way I prefer making it) a chunky fruit preserve. Winter is citrus season, so this is the time you lay in a good stock of marmalade to see you through summer. Valuable as home-made gifts, and far preferable to a bottle of cheap red plonk when visiting friends. All citrus are fair game for marmalade. Traditionally many prefer a mix of one lemon to three oranges. The smaller virtually seedless Valencia (sweet) or seeded Seville (bitter sweet) oranges are preferable to the larger, pithier seedless Navels. For a sweeter marmalade you can use Valencias, prized as a source of stable orange juice which does not become sour when kept (unlike the less stable juice of the Navel orange). But the marmalade afficionado prefers the tarter taste of the Seville orange which also has better setting quality because of its higher pectin content. Adding a lemon or two will give a sharper, bitter-sweet tang. 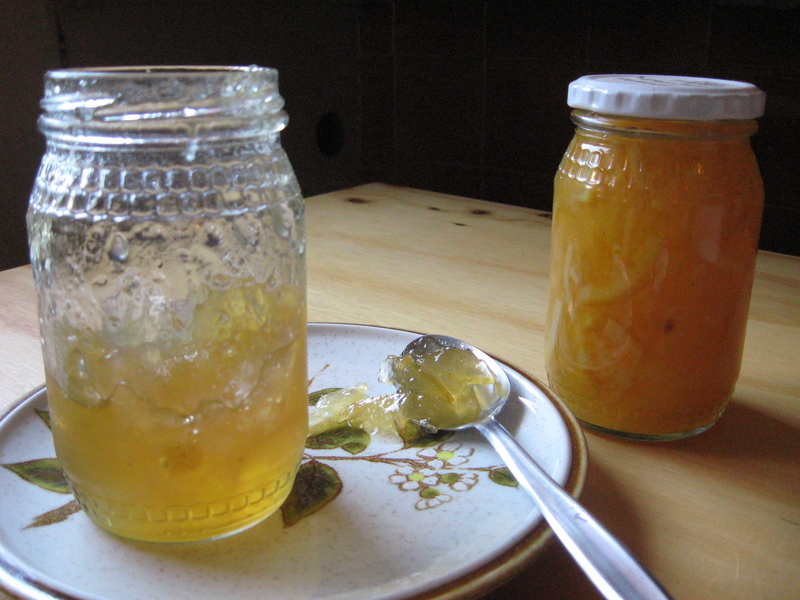 Adding a grapefruit gives marmalade a distinctive taste and lighter yellow colour. If you don’t like the chunks an d just want the jelly, then strain the boiled fruit through a thin cloth (authentic cheesecloth – or kaasdoek – is best) before adding the sugar. The following recipe has been developed through trial and error over the years and it works every time. As with most of our recipes I have stripped it down to the bare essentials – the stuff that works. Once you get it right, then you can ring in the changes (just jelly, or a few thin strips of peel, for example). This recipe uses four citrus fruits and makes just over 3 bottles (350ml, 500g size, honey-jars) of marmalade. You will need: 1 litre of chopped fruit (3 medium oranges and 1 medium lemon; or 6 of the smaller Valencia oranges), 1 litre (4 cups) of white sugar, 4 litres of water. This is a simple marmalade recipe that works well, especially if you are using Valencia oranges with or without a lemon. Lots of pips! Pips are rich in pectin and there is also some pectin in the pith. The pectin is activated by the overnight soaking. Cutting up the fruit. The Victorinox 11cm tomato knife with its rounded point and sharp serrated blade is best for this. 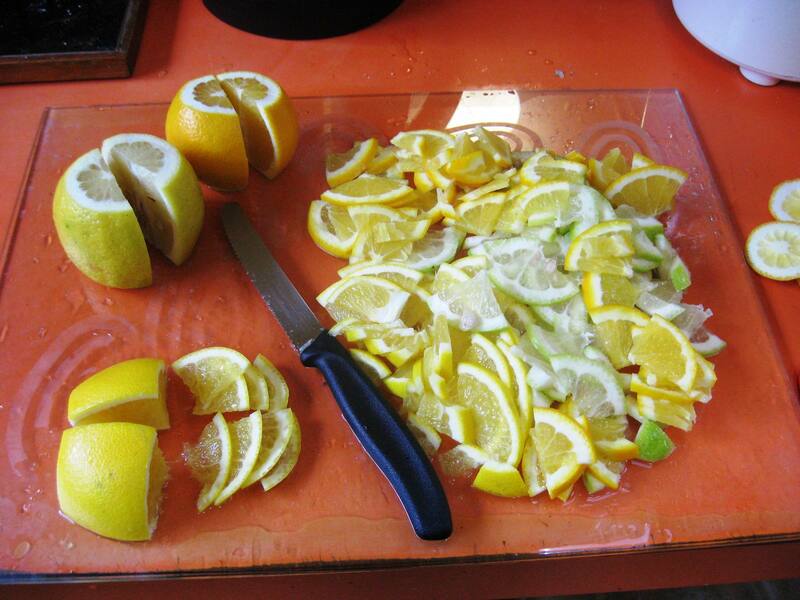 Preparation of fruit and soaking overnight: Cut off the thick tops and tails and then cut the fruit in half long ways. Taking a half fruit, face down, cut it in half again (also long ways) and then holding the two quarters together, thinly slice. Slice all the fruit, place in a bowl (including the pips) with three litres of water. Cover bowl with a plate and leave to soak overnight until the next day. Making the marmalade the next day: Boil quickly for an hour to an hour and a half to soften the fruit and reduce the water by several litres (you must boil off at least two litres of water). This gives an al dente chewy peel. For a softer peel add a further litre of water before boiling and boil off three litres of water. After the peel is suitably softened (you should be able to easily push a matchstick through a piece of peel), add 1 litre of sugar (4 cups – you usually use a cup of sugar for each cup of fruit you cut up in the beginning), stir using a wooden spoon and bring back to the boil and then turn down the ring to let it simmer for another hour or so. This is the time to fish out the pips as the seed testa turns a tawny orange and is easily visible as it floats to the top. You have to boil off sufficient of the remaining water until the mixture reaches setting point. Time this takes could be shorter or longer depending on size of pot – water boils off more quickly in a wider pot with a larger surface area. As the mix thickens it will foam up a little briefly, forming some scum at the side of the pot. Don’t remove the scum, just stir it back into the mix. Setting test: Test for setting by chilling a bit of the marmalade syrup from the pot. Either put a quarter spoon full on a chilled plate in the freezer and then push with your finger after five minutes. If it wrinkles and threads when you lift your finger it is ready. Or by dripping a few drops of jam in cold water on a plate (a block of ice in the water helps). It is approaching setting when the jam in cold water does not immediately dissolve (as it does at the syrup stage), but leaves a clean path when you draw your finger through it. It is closer to setting when you can draw a thin thread from the marmalade immediately you put it in the cold water. It is ready when you pour a few drops of syrup in the water and part seems to float to the top and a thicker thread forms when you touch the blob and lift your finger. Bottle it straight away: Pour the marmalade into a large heat-proof jug and using a ladle or small beaker fill the bottles to within a few millimeters of the top. Makes three and a half bottles if there is sufficient pectin. Wipe the bottle with a clean damp cloth, especially around the rim. Screw on the lid tightly. Using a marker pen either write directly on the lid (or on some masking tape stuck on the lid) indicating date, month and year. I also indicate what fruit mix I used (2L 2O for example). Some people pour melted candle-wax on top to protect the jam from mould. A bit pointless since the wax shrinks from the sides when it sets solid. 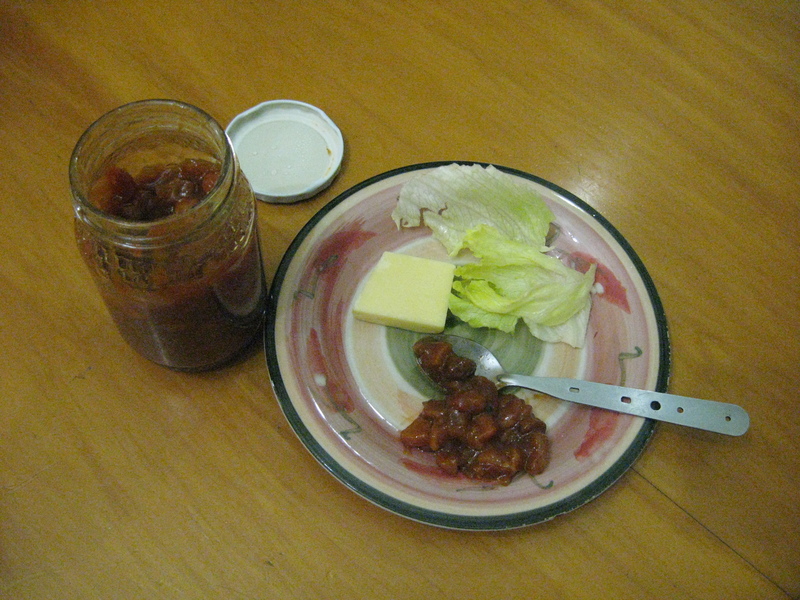 Better is soaking a pre-cut disk of wax paper in brandy and placing that on top of the marmalade before sealing the jar. Adds a bit of zing to the first few spoonsful! Both are unnecessary, however, if the bottle is clean and you screw on the lid firmly when the marmalade is still hot (hold the jar with a cloth – it really is hot! ).